There isn’t a whole lot you can do to get a roast wrong. But it also doesn’t take much to make it bloody brilliant. I’ve been eating roast chicken for a long time and I’ve peddled through all the usual suspects: plain salt and pepper, pre-marinaded store bought chickens, rotisserie chicken (never as good as you hope they’ll be – but if you have to, try Le Secret des Rotisseurs in Canary Wharf) but there’s always been something lacking. You just can’t trust a supermarket to do a meat lover’s work. The first problem is the moisture – depending on the recipe you follow, the heat of the oven tends to dry the meat out – especially the breast meat which doesn’t have a lot of fat to protect it. Instead of loading it with loads of extra fat, which will just pool around your chicken and destroy your vegetables and gravy, I keep the heat on the lower side (190 degrees on a regular oven, I reckon 180 on a fan assisted will do the job) and I stuff the chicken with a poached lemon to keep it moist from the inside. The second is flavour – the dark meat holds its own with simple seasoning because it already has a lot going on flavour-wise. The white meat is often not up to much but can also be ruined by overzealous seasoning (speaking from experience here). The basics are good – salt and pepper will pretty much never ruin anything but the chicken can do with a bit more help – I use the holy duo of garlic and lemon. The third is the chicken. Go for higher welfare and cornfed if you can afford it. This isn’t just an ethical matter, but a taste one. It’s worth it, believe me. 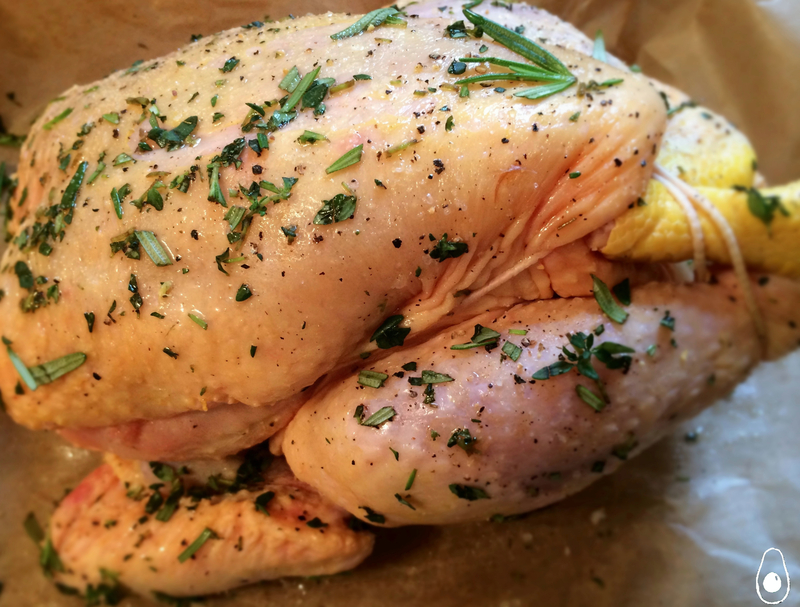 I’ve adapted this recipe from Jamie Oliver’s Lemon Roast Chicken. It serves 4. 1 chicken, big enough to feed 4 people. Peel and chop your potatoes to about golf ball size or a little bigger. Parboil these in salted water for about 12 minutes with the whole lemon and all of the cloves from the whole bulb. Don’t remove the skin from the garlic cloves. 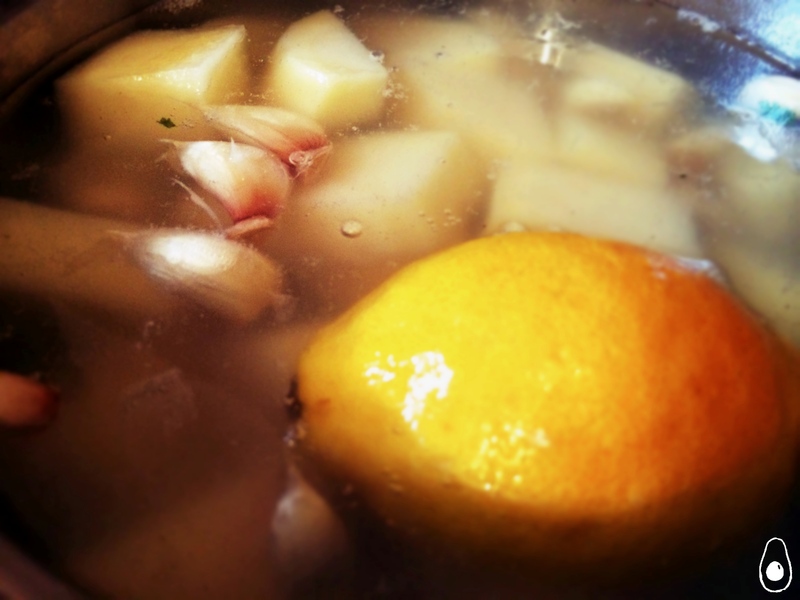 Drain the potatoes (reserving the garlic and lemon) and shake them around a bit to fluff up the edges. Meanwhile, cover a large roasting dish with grease proof paper. Preheat your oven to 190 degrees. Season your chicken liberally with salt and pepper. Pay particular attention to the cavity of the chicken – more salt than you think sensible should go in here. Take the lemon (from the potatoes), pierce it a few times, and stuff this and about half of the garlic cloves into the cavity of the chicken. Along with the salt, this forms a sort of self basting stock for the chicken. Place the chicken on top of a bed of red onions – make sure all the onion is covered or it’ll burn. 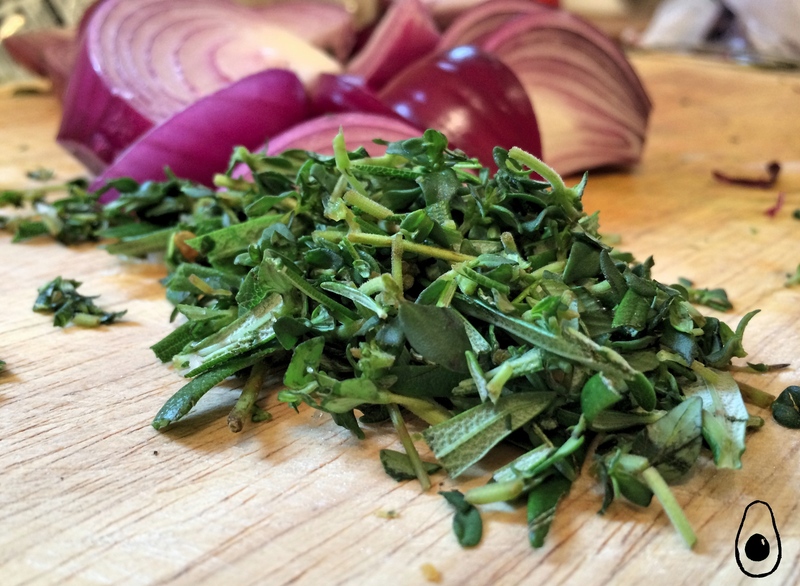 Spread half of the herbs all over the chicken and then spread half of the olive oil on top. Put this in the oven for half of the time suggested on the pack (generally 45 minutes for a 1.5kg-2kg bird). After that time has elapsed, take the chicken out and put it on a plate. Add the potatoes, the remaining half of the red onion, the remaining half of the herbs, and the remaining poached garlic cloves to the roasting dish and cover them with the fat that will have come from the bird. Add the baby carrots here at this point, if you’re including them. Make a well – all of the potatoes should be directly exposed to the heat in the oven – and return the chicken. At this point, take one of the garlic cloves, squeeze out the flesh and spread it all over the chicken. Put the dish back in the oven for the remaining recommended cooking time. When that time is up, move the chicken to a plate and cover with foil (or ideally place in an oven at a low temperature if you’re lucky enough to have a second). Siphon off half to three quarters of the roasting dish juices into a separate jug for gravy. Baste the potatoes with the remaining fat. Put these back in the oven and turn the temperature up to 220 degrees. Cook for a further 20 minutes. While the potatoes finish, prepare the gravy. Add some gravy granules (as per packet instructions) to the reserved juices. It might be prudent, at this point, to use reduced salt granules. Lightly cook the green beans – about five minutes on a low heat with about three tablespoons of water. After this, drain the water and lightly fry them with about half a teaspoon of butter, lemon juice, garlic and pine nuts for about 3 minutes. When the potatoes are done to your liking (they should be golden brown at the tips, crispy on the outside and soft on the inside), take the cloves in the chicken and pop them out of their casing. Spread the puree all over everything. Serve everything up, lovingly smothered in your gravy.